First off, I love the Olympics. I believe that the Olympics motivates and unites people of various backgrounds in a common goal. I enjoy the multitude of events, the rivalry and comradery of athletes, the interactions of people from multiple countries...I could go on and on. So I thought, "Why not bring this to my classroom?" 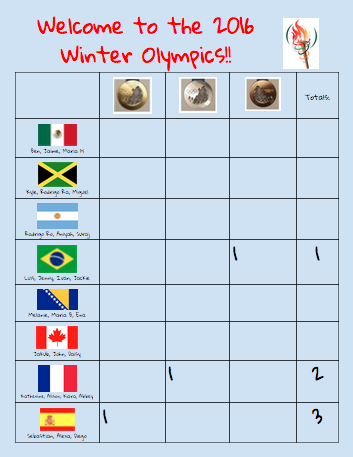 Now, I should preface this by noting that I have already tried implementing the Olympics in my classroom four years ago. The first time around, I will be honest, I bit off more than I can chew. I gave too many ways for students to win medals, I switched groups too often, and it became very cumbersome to keep up with. 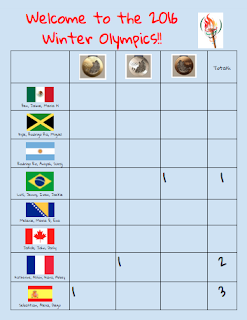 This year, I decided to develop the Winter Olympic Games focused around our weekly 10 ACT questions. As part of our curriculum, we have created one set of 10 standardized-test questions for each of our skills. Throughout first semester, students completed these either on paper or the Socrative app, but I could sense that students were getting bored by these methods. This is why I chose to develop the Winter Games around these ACT questions, to re-engage my students when heading into the ACT. To add motivation each week, the team that gets a gold medal chooses candy from my candy bucket. I'm keeping track of all of these scores in a GoogleDoc that is shared with my students on Schoology. In the end, the winning country gets to pick from a grab bag of items! In the early stages of the Winter Olympics, I have found students taking these questions more seriously. I don't necessarily know whether this is due to the ACT date coming up in April, the ability to discuss with peers, or the rewards of candy and grab bag items, but I like that they seem to have a resurgence of motivation. I also find the conversations to be intriguing. Students are defending their opinions as to why they believe a question is correct, some students are explaining to others how to answer a problem, and some are just feeling more confident in their own abilities without second-guessing themselves. It is always really exciting to witness students helping one another out and fighting over correct answers in math problems!